Here's my card for the current sketch at CAS(e) this Sketch. I used an image I colored earlier this week for the Daily Marker 30 Day Coloring Challenge for this space themed design. The astronaut is from Reverse Confetti's Moon Men stamp set. I colored the image with Copic markers and cut it out with the matching die. To make the background for the image, I die cut a circle from shimmery white cardstock and debossed it with a polka dot pattern to create a moon. I adhered the circle to a wavy patterned panel from one of RC's old Quick Card Panel packs that I trimmed down a bit to fit the layout. The panel's corners were rounded, then I matted it on a slightly larger silver panel. The astronaut image image was positioned over the circle using foam tape. I added the panel to a red card base, then stamped the set's "you're outta this world" sentiment just beneath it. A trio of silver glitter enamel dots arranged around the panel completed the design. 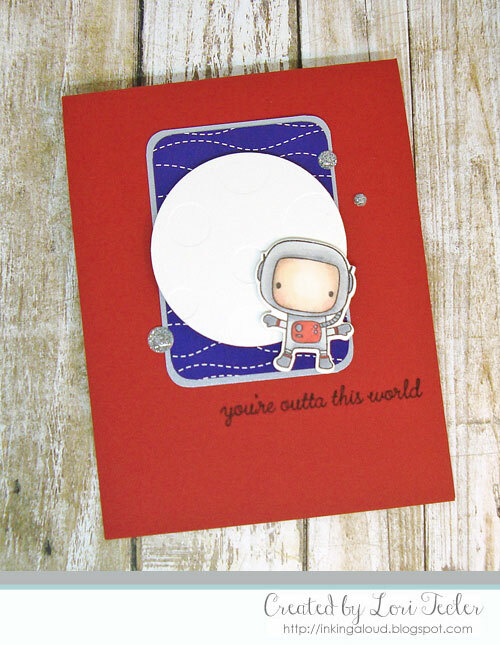 Love your space themed take on the sketch, Lori! That astronaut is adorable! Super cute take on the sketch! This is so fun!